16'' Electric Skillet by Presto at Baking Love. MPN: 06850. Hurry! Limited time offer. Offer valid only while supplies last. 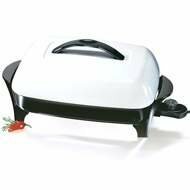 16'' Electric Skillet roasts, fries, grills, stews, bakes, makes casseroles and more. Innovative EverNu cover won't dent, warp, peel or bend.